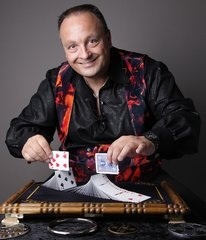 Professional close up magician performing technical sleight of hand magic with coins, cards and various small objects in a "Table Hopping" and/or "Mix and Mingle" format. Suitable for wedding receptions and all kinds of corporate events. Also perform for hotels, restaurants and wine bars, as well as on exhibition stands at trade shows nationwide.